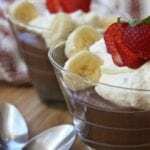 The sweet decadent dance of chocolate and banana with the healthful benefits of grass-fed dairy is what you will find in this Creamy Banana Chocolate Pudding. Who doesn’t love pudding? I mean it’s creamy, smooth and sweet. What’s not to love about this dessert? In our fast paced world nowadays we have the convenience of swinging by the grocery store and picking up a box of instant pudding. It takes minutes to make and hey, what a great diet treat. Right? Ok, so here comes my tree hugger side. I don’t know of very many people that would shop for some of the individual ingredients listed on the highly time saving pudding packages. “Excuse Me Mr. Grocery Man, can you tell me what aisle the Tetrasodium Pyrophosphate and Butylated Hydroxyanisole is on? Oh Yeah, Can you also help me find some of those Artificial Flavors that are so popular these days?” As a society we have sacrificed by using ingredients we would have never put in our foods years ago, for time. I have to wonder about the high rate of health issues we face today and the lack of control over our foods. We lost sight of how cooking used to be done using simple ingredients. Back when we used to make our meals and desserts from scratch and the basic ingredients were words we could pronounce. I don’t know about you, but I would take milk and eggs any day over Tetrasodium Pyrophosphate and Butylated Hydroxyanisole. Take a step back in time with me, your taste buds will thank you. 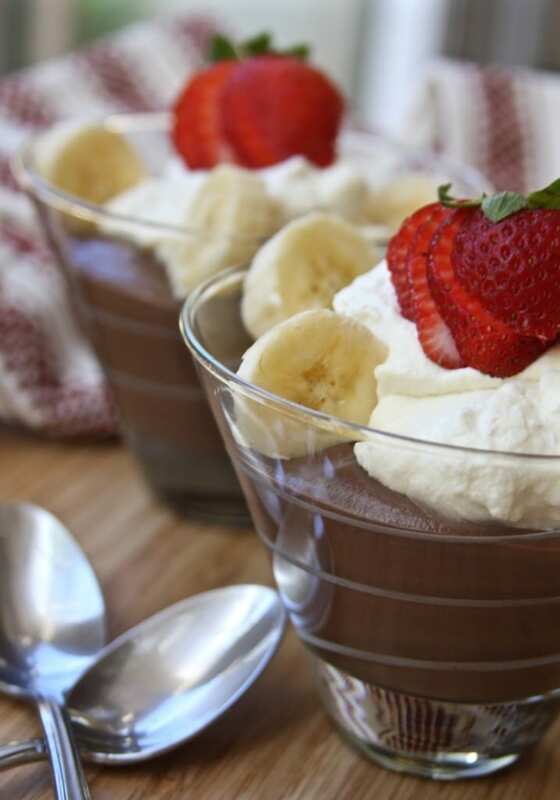 This Creamy Banana Chocolate Pudding uses simple and delicious ingredients. What a wonderful treat to look forward to at the end of the day and it tastes like a chocolate dipped banana. One of my favorite ingredients used in this Creamy Banana Chocolate Pudding is Organic Valley’s Grassmilk with Cream on Top. I love it for two reasons. 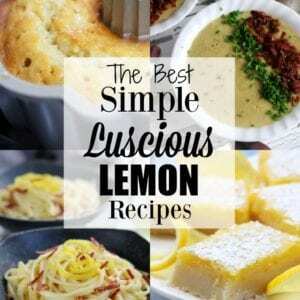 The first, it is an incredibly delicious way to incorporate conjugated linoleic acid (CLA) and omega-3 fatty acid. The second reason is it incredibly delicious. For the longest time we have been trained as a society that fat is the root of all evil and we have short changed ourselves some valuable nutrients. I whole heartedly believe that whether your goal is weight loss or optimal health, optimizing nutrition is the best approach. What that ultimately means is replacing fairly empty calories with nutrient dense ones. 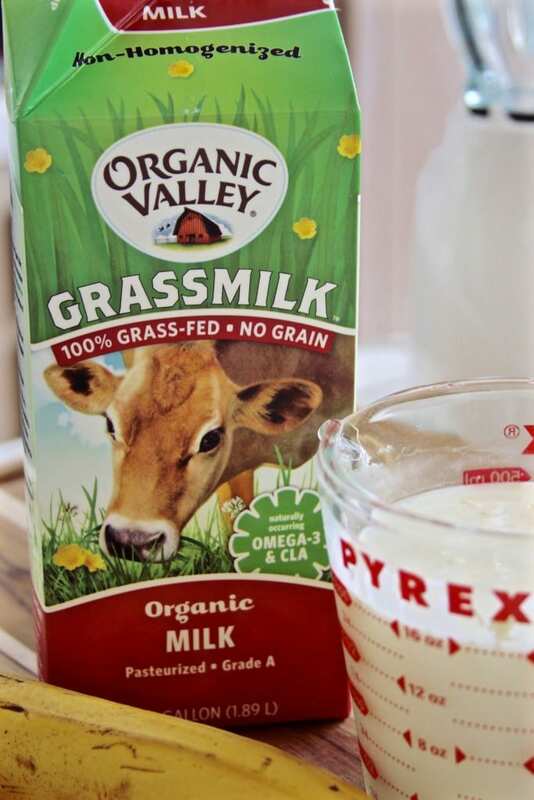 Organic Valley’s Grass-Fed Milk vs regular Skim Milk is a perfect example. 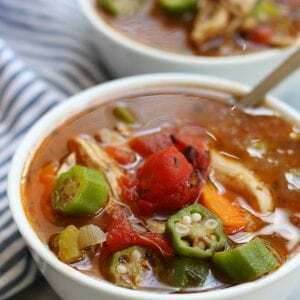 Being cautious of portion size will help in keeping calories in check. Trying to switch to a more optimized nutrition plan can be challenging for many different reasons. One of the biggest reasons is simply adjusting to the products. When I first purchased this milk, I was caught off guard by the literal cream on top. It looked like milk curds to me. With a scrunched up face I closed in on the carton to smell what I thought would be sour milk. To my pleasant surprise it smelt like cream. It didn’t take me long to figure out that was they way milk was supposed to be outside of being Raw (unpasteurized) or pasteurized at lower temperatures. Once adjusted to this wonderful milk you will wonder why on earth didn’t you purchase it sooner. In addition to the milk, what makes this Creamy Chocolate Banana pudding unique is the chocolate dipped banana taste. The best part is, there are no artificial banana flavors. It is a real banana with potassium, magnesium and folate. So many of the banana pudding recipes call for just slicing the banana and layering it in the pudding. Instead, I blended the banana with the milk before thickening. Banana milk, mmmm… now that is sweet cream. Just make sure that the banana is not over ripe because it will overpower the chocolate. The hardest part of making this dessert is the time involved with the thickening. I suggest either putting on some great music or anything entertaining while whisking away. Layer this Creamy Banana Chocolate Pudding with the fresh whipped cream. 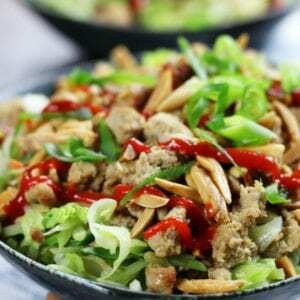 It is great after school treat using real food ingredients. Enjoy!!! *Before making dietary changes seek advice from your health care provider. Information contained within this post is opinion based. I am not a licensed health care professional. 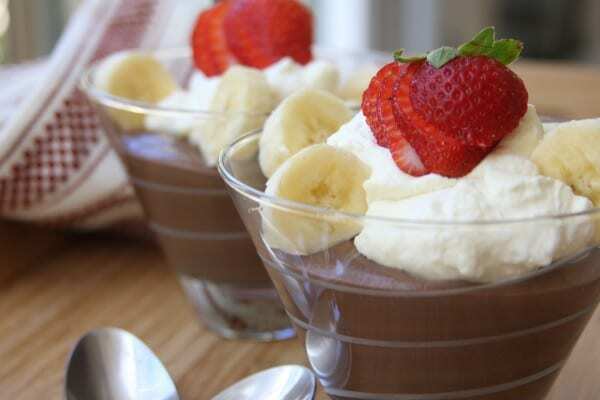 A decadent creamy pudding using organic ingredients that tastes just like a chocolate dipped banana. Pudding- Peel and blend banana with milk in a blender. 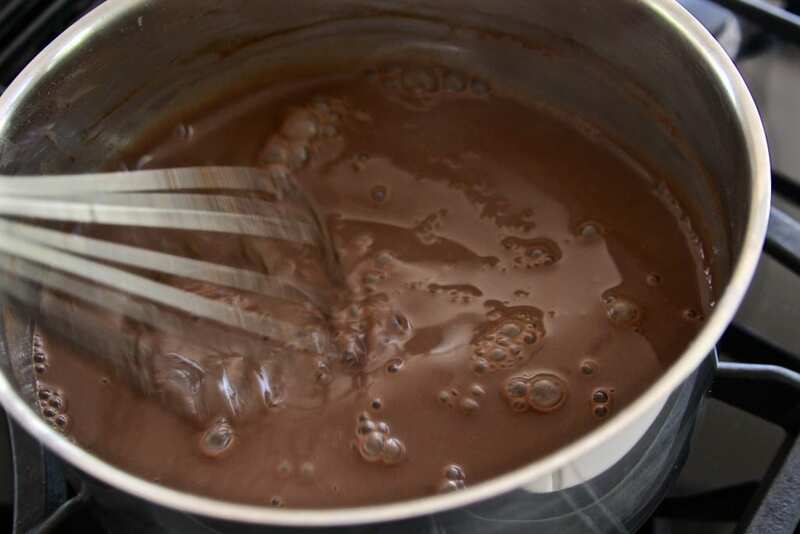 Measure sugar, cornstarch and cocoa powder in a large saucepan. Slowly add banana milk to dry ingredients while whisking. Cook on largest burner over a med/low flame while constantly whisking until thickens, approximately 25 mins (give or take a few mins). Take off heat. In a separate bowl whisk egg yolks and temper with a small amount of hot pudding. Add egg mixture to pudding and cook for another 2 mins. Remove from heat and stir in vanilla and butter. Stir until incorporated. Place in a glass container and place a layer of parchment paper over top to prevent skin from forming. Cover and refrigerator for at least 2 hours before serving. 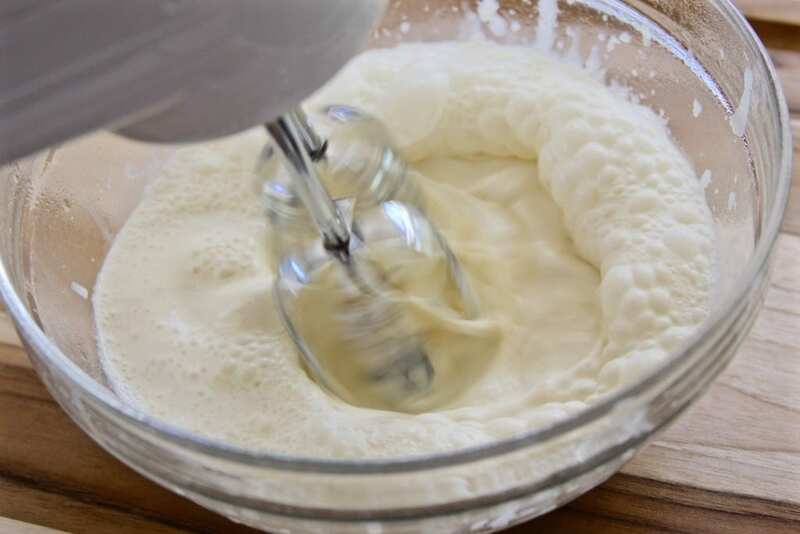 Whipped Cream-Chill a medium size mixing bowl for 15 mins. 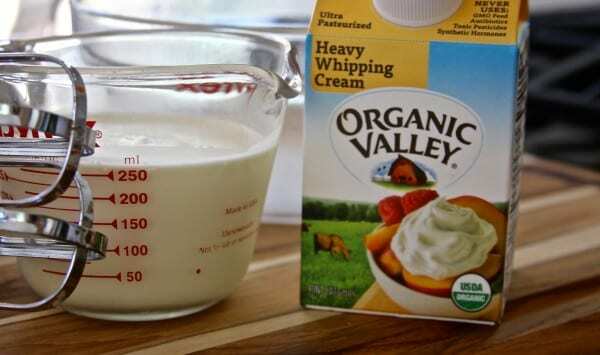 Once chilled, measure heavy whipping cream, vanilla and sugar into bowl. Mix on low speed with a hand mixer for approximately 5 mins. Be careful to not over mix as it will start to turn to butter.